The location of CASALA TEATRO It is as exceptional as the room itself. 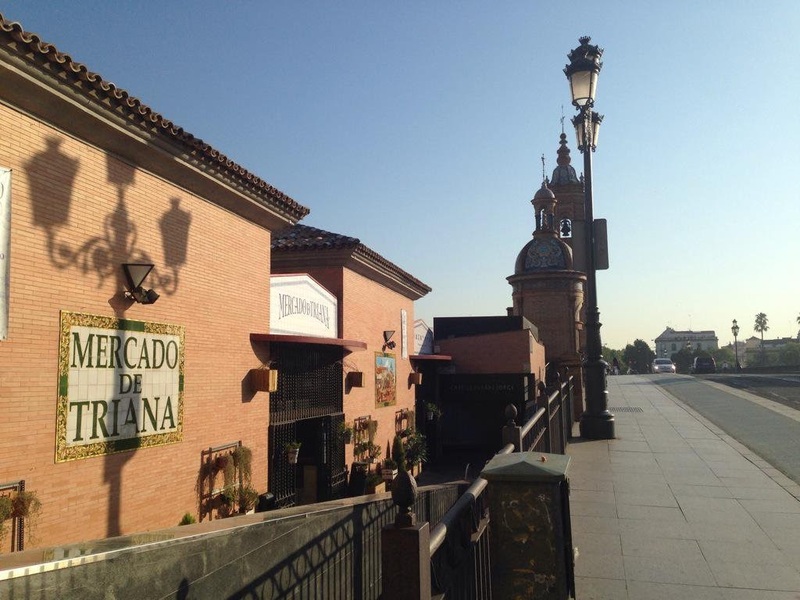 Its about Triana market, The heart of one of the most important neighborhoods of Sevilla, birthplace of Flamenco in Sevilla alfarera important area for centuries. In the low market are the remains of the Castillo de San Jorge, home of the ancient inquisitorial tribunal. This castle was the seat of the Inquisition since 1481, although its original construction dates back to 1171, during the Arab period. After falling into disrepair and being repeatedly flooded by the flooding of the Guadalquivir, in 1823 he settled in his solar Market Square. A strategic market, since its location allowed the unloading of ships coming to Seville by the river, the sale of crops of Alcor and be a meeting point for traders coming from the Ruta de la Plata. In 1992, on the occasion of the Universal Exposition in Seville in 1992, the market was temporarily moved to the street Pagés del Corro. During the refurbishment came to light the remains of the ancient castle of San Jorge and an unknown almohade cemetery. 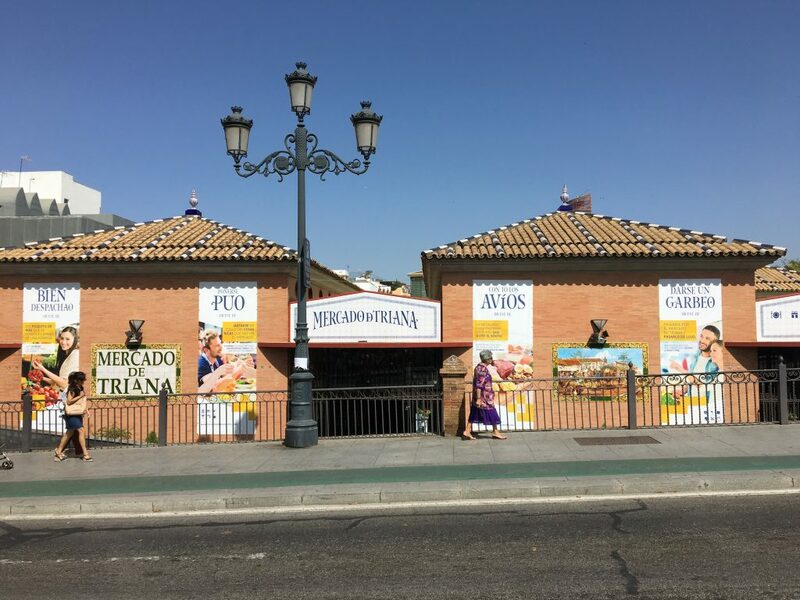 In 2001 the current Mercado de Triana, a place where lives bustle of shopping and local produce with the San Jorge Castle Museum was inaugurated. Photography Mercado de Triana, in the Hillock, near the bridge of Triana. Maybe the Triana one of the few markets that, despite combine stalls and restaurants, has not lost one iota of its essence. Fruits, vegetables, fish, meat, vegetables, pickles cheese ... and bars, restaurants, osterias, juice bar, patisseries ... Even a cooking school and THEATRE. Rectangular and with one of its long sides facing the river, the market has three main entrances, the entrance next to the bridge of Triana, which is located on the opposite front to meet the Callao and Castilla streets, near the Arc alley of the Inquisition and finally, access from Calle San Jorge. Inside the square posts are distributed in parallel and perpendicular streets, forming an orthogonal grid; 5 long traversed by a central and at the end, near the high wall of the old castle streets. On each trade its corresponding numbering and hand-painted on ceramic panels in line with the pottery tradition of Triana name appears in each case. Mercado de Triana photograph with the bridge of Isabel II and the chapel of Carmen at the bottom.